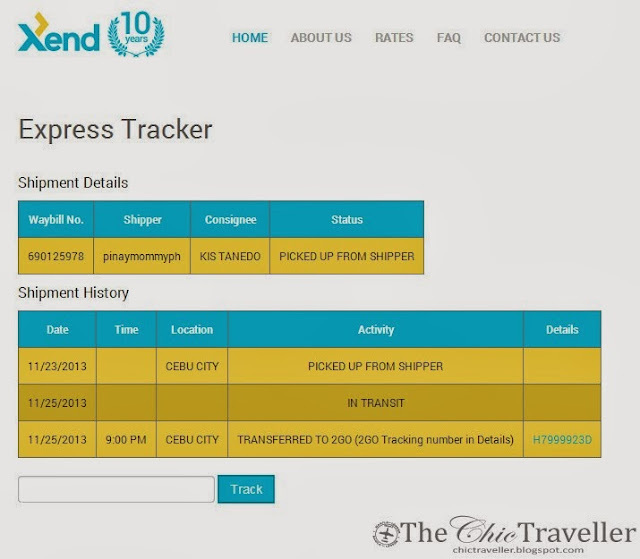 As a follow up post to my review on the three Metro Manila couriers Xend, Metrowide & Philfox, I want to share with you my experiences with their tracking and delivery. 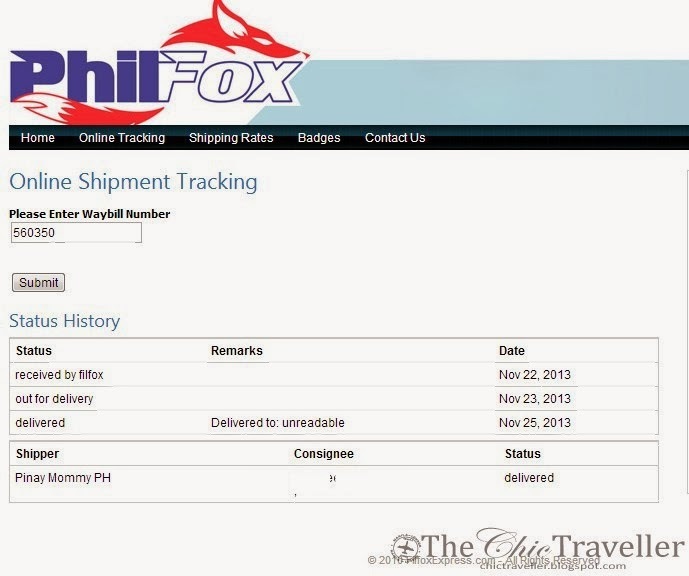 For Metrowide and Philfox, delivery was just within Metro Manila. For Xend, I tried their provincial service. Let's take a look at Metrowide first. Their site is pretty much updated. Once the package was shipped out, the tracking was available the next day. 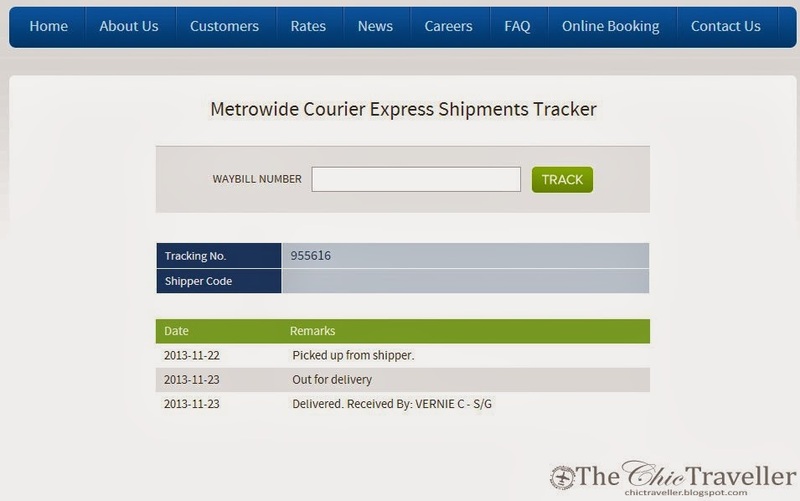 What I like about Metrowide is that it confirms that the package was received complete with details about the person who received it. My package was delivered the next day after it was picked up. Philfox and Metrowide packages were shipped out the same day, and were also both delivered the next day. I both like their speedy service. One thing I noticed about Philfox tracking though is that the delivery update is not up-to-date. Notice that the delivered status was updated November 25, yet my consignee already confirmed that the package was delivered on November 23. As I've mentioned in my previous review, I like it that the Xend guy in our area picks up packages before lunch. However, delivery is another thing. My package to Cebu was suppossedly for next day delivery. However, it arrived 2 days AFTER its delivery schedule. Instead of my package arriving either on November 25 or 26, it arrived on November 27 evening. It was at least a day late. The tracking from Xend also gives a link to the tracking number of their provincial partner 2GO in their details section. 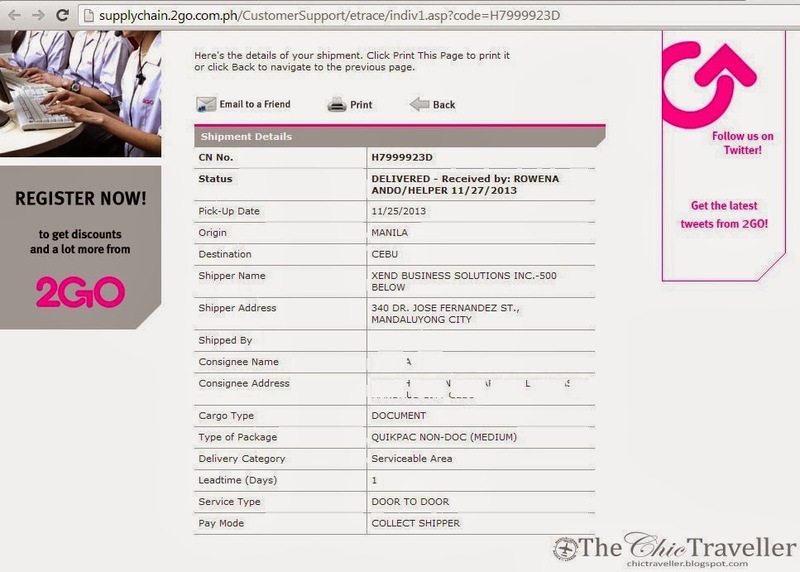 When I followed up on Nov 26, the tracking details for 2Go was not yet uploaded. I sent an email out to their customer service to check on the status. They replied Nov 27, and by this time they have already updated the details on the 2GO website. Here's a sample of the tracking update shown on 2GO. It will show up once the link from Xend website is clicked. I like that they also confirm who was able to receive the package. However, I think that their delivery time is just a bit too late. I don't think it's entirely Xend's fault. 2GO may just be delayed in delivering packages. However, I personally think that Xend should not advertise next day delivery for their provincial packages if their partner 2GO is not able to deliver. In the next few days, I hope to be able to try Philfox or Metrowide provincial services as well to compare with Xend. Currently, I'm loving Metrowide's service due to their fast feedback and confirmation online for my pickups. They also promptly pick up and deliver my packages within Metro Manila. I am looking for couriers who offer cash on delivery. I found BayadPo but I still have to try it. I hope you can review it also. Hi Pixel and Gretel! I haven't tried BayadPo. I'll let you know when I have. Thanks for dropping by! Thanks for the reviews. Do you have latest update? I am looking for couriers. Have you tried Abest?